PowerEdge T20 (PowerEdge T20). Model: PowerEdge T20 (PowerEdge T20). Storage type SATA 2 x 1TB 3.5" SATA. 100% Tested. All HDD's SMART Tested and erased. Overall a really nice system. This server has no front bezel (Does not effect performance). Board Form Factor uATX. Chassis Form Factor 1U Rack. 1U rack system with S1200SPOR board and 4 x 3.5 hot-swapable HDD. Rack Rails Included No. Rack-Friendly Board Yes. Expansion Options. Integrated Graphics. Supermicro server... Xeon e3-1220 v2, 4gb ram, 1tb hdd. Windows 10 enterprise installed One missing hdd tray as in photos Condition is Used. This item is tested and working, and has been reset to factory defaults. Other Information. Fujitsu tx120 s3 server 2016 Datacenter xeon E31220 24gb Ram 2 X 500gb HDD . This is a nice little fujitsu server with windows server 2016 installed and activated. Please see pictures. 2 X 500gb sata hard drives ( 1 for OS and one for data). 24gb ram installed Additional nic card installed Front key included Since the server is used, it will have signs of cosmetic use. Xeon e3-1220 quad core processor Item will have to be collected from an address in Batley, West Yorkshire. Powerful,efficient,versatile. Consolidate data and drive applications faster with the powerful,efficient and versatile PowerEdge R230 entry rack server. - Hard Drive: 1 x 1TB SATA 7200 rpm. - RAM Installed: 8GB DDR4 SDRAM. 1 x Supermicro SuperChassis - Xeon Quad E3-1265L V2 2.50GHz 32GB RAM 1U Chassis. Processor - 1 x Xeon Quad E3-1265L V2 2.50GHz. Motherboard - X95CL-F. Optical Drives - None. Storage - No Hard Drives Included - 4 Caddies included. This exceptionally engineered server provides rock-solid hardware. The ThinkServer platform is now greener with efficient power supplies. These attributes ensure reduced energy costs through reduced power consumption and efficient zoned cooling. HP Proliant DL120 G7 In Good Condition, Full Working Order, has Microsoft Server 2016 trial installed just for testing. No Rack Mount Rails Included Included; 1 x HP Proliant DL120 G7 4x 3.5" Bay 1U Server Specification Processor - 1 x Xeon Quad Core E3-1220 3.10GHz CPU Memory - 8GB DDR3 RAM (4 x 2GB) Hard Drives - 4x 3.5" Hard Drive Bays (2 x 1TB Hard Drive Included) RAID - HP Smart Array P212 RAID Controller 1 x 400W PSU Item is listed as collection only due to its weight and size. It can be collected either from my home address in Reading or my work address in Watford. Any questions, please dont hesitate to contact me! 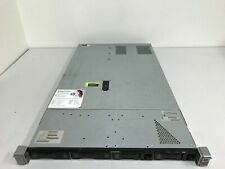 QTY 1 x Supermicro 1U CSE-815TQ 4 Bay 3.5" drive storage chassis. The systems have been refurbished and all 4 x 3.5" drive trays are included, plus 1U rack rail kit. Refurbished Supermicro server system. Available for sale is a HP DL320e G8 Gen8 1U Server 470065-777 (Xeon E3-1220 V2 / 16GB / No HDD / B120i) 0KP. This server is tested and working, and has been reset to factory defaults. This server has no cabinet-side receiving rails included, sorry. Hard Drive: 1 x 1TB (hot-swap) SATA 7200 rpm. - RAM Installed: 8GB DDR4 SDRAM. Drive SMB and remote office/branch office applications faster with a powerful and expandable 1-socket,high-availability entry rack server. PowerEdge T130. Micro / Mini Tower : Module, Chassis, 4 X 3.5 HD, Cable, T130. 1TB SATA Hard Drive (7200 RPM). 8GB DDR4 at 2400MHz (1x8GB). 8x DVD /- RW Drive. Integrated Realtek ALC269Q High Definition Audio. I was running FreeNAS on it and it worked beautifully. This has been my server and it has been looked after of course and works flawlessly. Excellent condition. Great server for FreeNAS, virtualisation, VMWare Citrix etc. 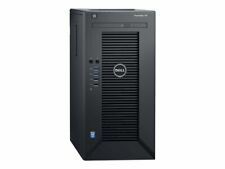 DELL Websense V5000G2 Web Security Appliance / 8GB Ram Intel Xeon E3 1240 Model E10S No hard drive installed. Will come as pictured. Fully working and good condition. Any questions please ask Postage cost is for UK mainland only outside the UK mainland please message for a price before buying. Hard Drive: 1 x 1TB SATA 7200 rpm. Run applications,share information or access your data from any workstation in the office and let employees work collaboratively by moving to a server-based network. Hard Drive: 1 x 1TB (hot-swap) SATA 7200 rpm. - RAM Installed: 8GB DDR4 SDRAM. Drive SMB and remote office/branch office applications faster and grow your data with a powerful and expandable 1-socket tower server. Xeon E3-1220 v3 @ 3.10GHz. 8GB of RAM. HP B120i Smart Array. All hard drives are fully tested by performing a HMG Infosec Level 5 wipe on them. This server has been powered up to BIOS with no issues reported. HP ProLiant DL320e v3 G8 LFF, Xeon E3-1220 v3 3.10GHz, 16gb Ram. Free Shipping. HP ProLiant DL320e V2 G8, Xeon E3-1220 v3 3.10GHz, 16gb Ram. No HDDs/OS. Condition is Used. Perfect machine for virtual machines, testing and “lab” work, especially as ILO allows remote boot/KVM. Short depth 2x 3.5” Drive model. 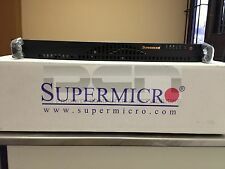 Supermicro X10SLL-F Xeon E3-1220v3 3.10GHz 24GB DDR3 ECC - more RAM!!! 24GB DDR3 ECC - 2 x 8GB 2 x 4GB. It's perfect for all sorts of network appliances - proxy, firewall, etc. HP Proliant DL120 G7. 1 xHP Proliant DL120 G7 4x 3.5" Bay 1U Server. Processor - 1x Xeon Quad CoreE3-1240 3.30GHz CPU. Hard Drives -4x 3.5" Hard Drive Bays (No Hard Drives Included). No Rack Mount Rails Included. All hard drives are fully tested by performing a HMG Infosec Level 5 wipe on them. As there is no hard drives included we did not test any further or attempt to install an OS. No Hard Disk Drive. There is a Windows 7 Professional CoA attached to the case. Run applications, share information or access your data from any workstation in the office and let employees work collaboratively by moving to a server-based network. - RAM Installed: 8GB DDR4 SDRAM - ECC. RAM: 32GB (2x16GB) Samsung 2133MHz ECC DDR4. HDD (Storage): 4TB Western Digital RED 3.5" OEM. SSD (Boot): 256GB Micron 1100 M.2 SATA. SSD (Storage): 1TB Samsung 840 Evo 2.5". Specs of the server are as follows. SSD: 2 x 250GB SSDs. CPU: Quad Core Xeon E3-1225V3 3.2 GHz. RAM: 16GB DDR3 SDRAM (1333Ghz). The server is running VMware Esxi 6.5 and Windows Server 2016 and Windows 10 Pro as VMs.